As you may know I am quite a fan of tea. Indeed I keep myself hydrated mostly from either tea or gin. 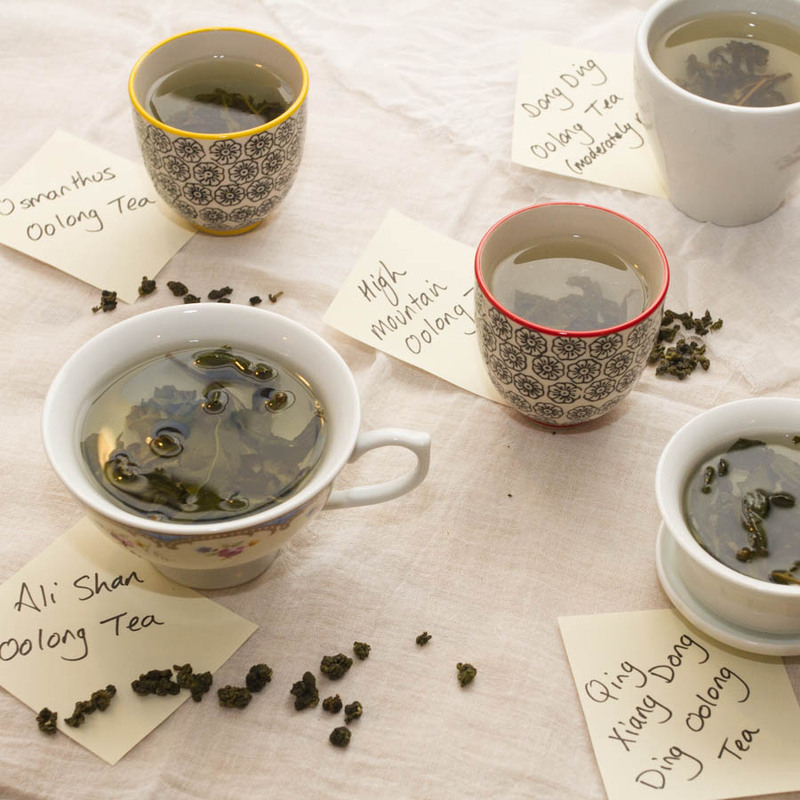 I like all teas: green, white, black, floral, flavoured but I draw the line at lapsang souchong. That smoky tea is just not for me. I have reviewed some of Teavivre’s teas before and this selection of tea is from Taiwan; something I have never tried before so I was interested to see what they were like. 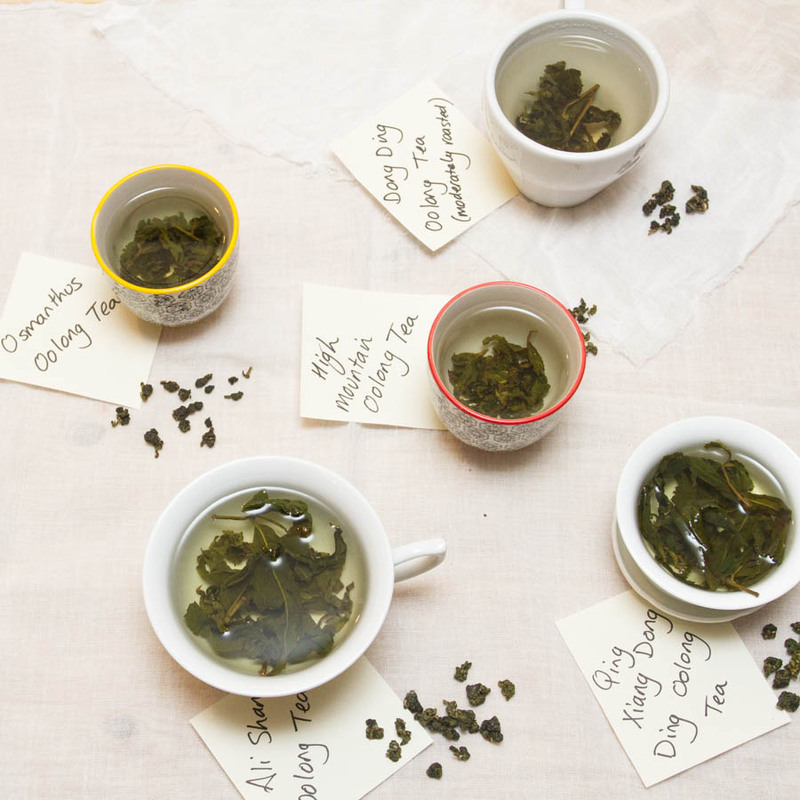 There were five teas to try (I almost didn’t have enough appropriate chinaware) and below are the notes I made about what I thought they tasted like. In case you are wondering the little piles of stuff next to each cup are what the tea leaves look like before they are made into tea. Ali Shan Oolong Tea – grassy and acidic flavour with lovely long tea leaves, this one was really fresh. High Mountain Oolong Tea – clean and fresh flavour with a slight sweetness, I liked the little curly leaves. Dong Ding Oolong Tea (moderately roasted) – toast and chocolate flavour, again with nice long leaves. Qing Xiang Dong Ding Oolong Tea – floral, citrus and liquorice flavours with long leaves, this one was my favourite. Osmanthus Oolong Tea – pomegranate and fruity taste and slightly toasty. I think the rolled leaves look nice before you add the water and they look beautiful when they are all uncurled. I really enjoyed the teas and liked how they are different in taste and appearance from other green teas. Tea is liquid wisdom don’t you know, well let’s hope so. Thank you to Teavivre for the samples. All opinions and words expressed are my own. Lovely little post and nice pics! I mainly hydrate via tea and gin too! That’s so funny, I like keeping myself well hydrated with gin also. It is black coffee for me at home but we tend to be huge tea drinkers in work. we like to have a varied selection. Yes to Oolong Tea! One of my favs either iced or hot. We have Gong Cha in Melboyrne and I always get Oolong Tea with pearls and their signature milk foam…sounds weird but it’s AMAZE!!! We’re soul mates! I drink tons of tea too. And gin? I’ve been known to have a drop. 😉 Really good (and funny!) post. Thanks. The “drinking tea culture” is obvious over here. We have lots of varieties from all our the world an I’ve plunged into some.